'Value added' landscape no. 11 is one of a series of ''Value added' landscape' paintings created by the late conceptual artist Ian Burn from 1992-93. It is a significant work that synthesises Burn's thinking on the tradition of Australian landscape painting, representation, language, art-making and its reception. The painting incorporated into 'Value added' landscape no. 11 is an amateur landscape collected from a market or junk shop which the artist has then overlaid with text on Perspex. Burn explained that this phrase 'at alternate moments, describes the picture, addresses the viewer and reflects on itself as text'. The effect of mirroring and reflection is an important aspect of Burn's work from the late 1960s onwards which implicates the viewer and the location of the artwork as essential to how we 'read' it. 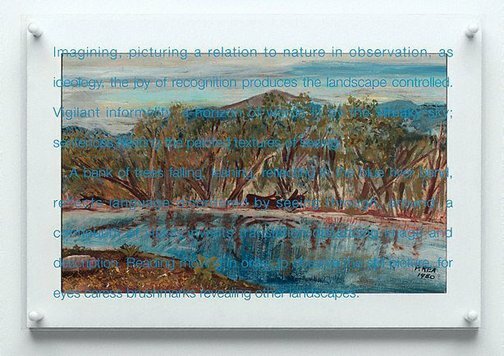 Natasha Bullock, Contemporary: Art Gallery of New South Wales Contemporary Collection , 'Landscape, mapping, nature', pg.290-331, Sydney, 2006, 292, 300, 301 (colour illus.). Ian Burn, Collaborations , "Notes on 'value added' landscapes", 1993. Denise Mimmocchi, Australian Symbolism: the art of dreams , ‘The sunny south: the landscape as Aesthetic ideal’, pg.81-90, Sydney, 2012, 82. Ann Stephen, Artists think: the late works of Ian Burn , Melbourne, 1996, 98 (colour illus.). Ann Stephen, Australian Journal of Art 9vol. Xii , "'Value Added' Landscapes, 1993-93", 1994-1995.